So... Some of you may have seen this on the old forum, some not. Resharing because. My 1911, semi custom. Frame is Foster/Caspian, slide is RIA, barrel is Oly, guts are a mix of Wilson, GI, and Colt. Frame pins are Swenson. Love this thing. Building a second, which I hope to finish by next year. Looks good from here - thanks for showing it to us. After shooting IPSC/USPSA I had so many parts I recently bought an Essex frame and slide to put another together. Slide and frame Essex and everything else is Colt. I've got another Caspian/Foster in the works. Want to make this one a little more tactical...got the mag well frame, stainless pins, high rise tail, arched housing. Want to go traditional guide/spring, and really want a Nowlin barrel, tritium Novaks, long trigger. Bobbing the mainspring housing is the best "new" idea for 1911's to come along in the last 20 years or so, IMHO. Yours is looking good Deacon. What kind of grips are those? I don't think I've ever seen them before. 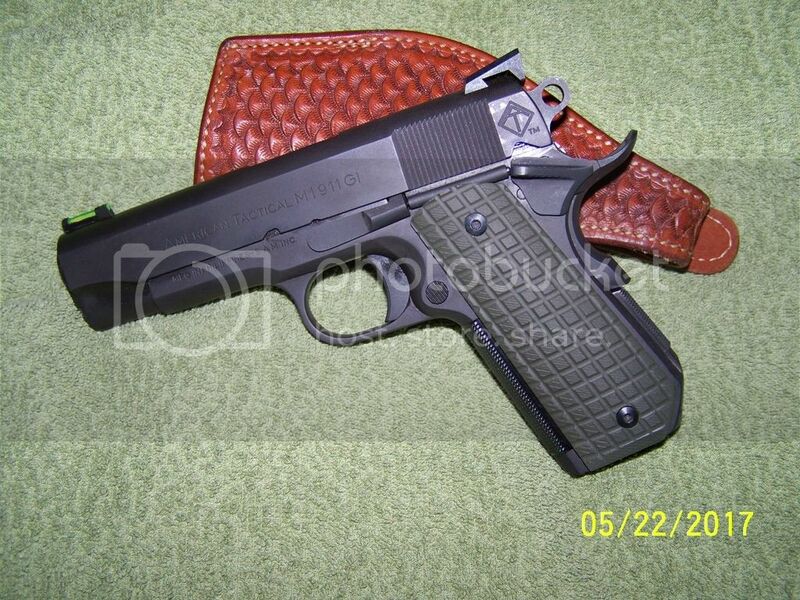 What is the finish you used on this 1911 and how is the finish holding up. I am doing some stippling to my ria, and am trying to decide on a finish. Leaning towards rust blue or cerakote. Last edited by Hams03 on Sun Nov 05, 2017 3:39 pm, edited 1 time in total. The finish is Cerakote on the frame. Slide is parkerized. Been holding up fine the last few years. Seems pretty tough to me. I like it. Ok good to know thank you. Nice to see some others enjoy building 1911s. Arkyboy got me into it a few years ago.